Chairman Johnson and Gentlemen of the Commission, thank you for allowing me to speak tonight. 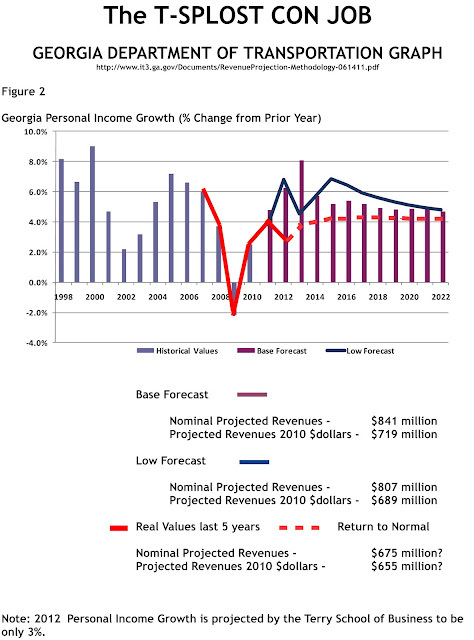 I have come to sound a warning about the proposed new 1% Transportation sales tax that comes before voters July 31st. Frankly, in all the years following public policy I have never seen anything this shameful. The greater shame is on this county's legislators – Bill Jackson, Lee Anderson, and Tom McCall for springing forth such an assault upon the people of this county. The bill that gave rise to this abomination was called the Transportation Investment Act. This bill set up a regional transportation roundtable for 13 counties, including Lincoln County. While it is true all had input, the law set up an executive committee of 5 to have the final vote for the 13 counties. They set it up so that Lincoln County is forced to be in this whole new level of regional government, whether we vote to pass or fail, so that our votes are diminished. This is taxation without representation. Worst of all they committed EXTORTION against us all, by denying state funds if we say “No!” Beyond this, this is a 14.2% tax increase that they swore to never vote for. Nor were any options even offered, like dedicating the 1% to our county. Yes the shame is upon them and tonight I come to ask you to stop embracing this nonsense lest you bring greater shame on yourselves and the Chamber of Commerce, a group that risks its reputation by hawking this tax. Politicians and Chamber representatives have been going around the CSRA saying this tax will raise $841 million under a base case. This is a LIE and the Promoters' own data shows that. Here is a chart showing the base case. It is built on wild income growth numbers – 8% next year – that are a fantasy. The real numbers knock holes in these projections! Will we get only $650 million? 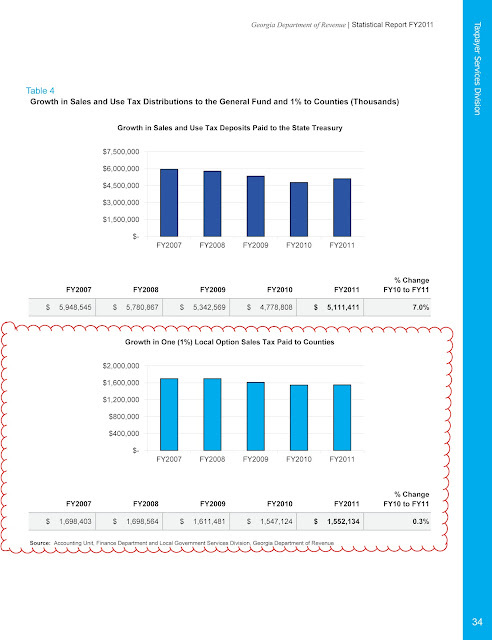 Sales tax revenues are WAYYYYYYY down as the blue charts show over the last 5 years. Can we pretend our way back to prosperity? Gentlemen YOU HAVE BEEN HOODWINKED!!!!!!! What these real revenue numbers show is that area wide, revenues will probably only cover $500 million to $540 million of the investment list projects! This will mean that the ones in the last years of this deal won't be funded. Incredibly $6.6 million of the $7.7 million of Lincoln's projects are to be built in these final years. The numbers say these projects will lack funding. You have been deceived and now are being asked to foist this deception upon the people of Lincoln County. Beyond that, this is a terrible 14.2% increase in the sales tax. Frugal folks just cannot stand such an increase in any cost, for a 14.2% increase doubles living costs in 5 years. For this? 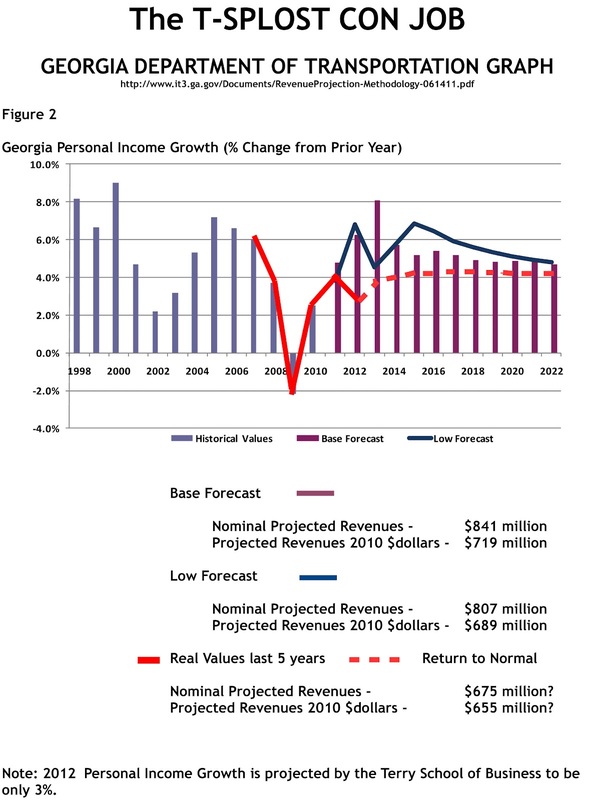 This comes on top of a 23% sewer rate increase and several double-digit school tax increases. Look around! Who can afford that? These deceivers have managed you get some of you excited over Lincoln County getting $722,000 a year in new discretionary funds. Well, based upon the data above this looks to be far less. This money is only coming to us because this scam makes Richmond and Columbia counties give up $7 million to bribe us into this wicked partnership with them. How is that right? 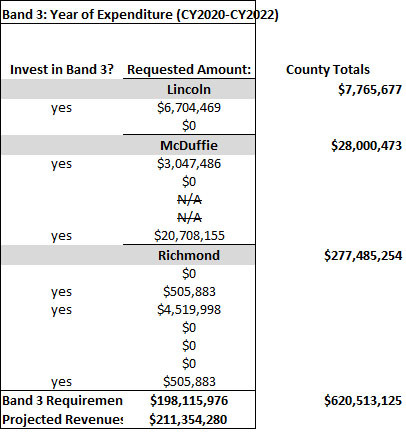 A 1% new tax dedicated to Lincoln County would raise more revenue. Why are you excited about the same money or less with strings attached? Why are you willing to destroy your credibility for this? Gov. Sonny Perdue said that DOT committed ENRON ACCOUNTING when it lost control of highway funds 4 years ago. Now they are all excited about getting their hands on this money. They want us to bail them out. Mark Twain once said there were three kinds of lies....Lies....Damned lies and statistics........now we can add a fourth lie – Tsplost. My warning is this. Don't go forth using these phony numbers after tonight. You know better and the people now know better. Just vote no on T-splost. It is the only honorable thing to do. For more reality based information on what Tsplost really is all about visit CityStink.net online.